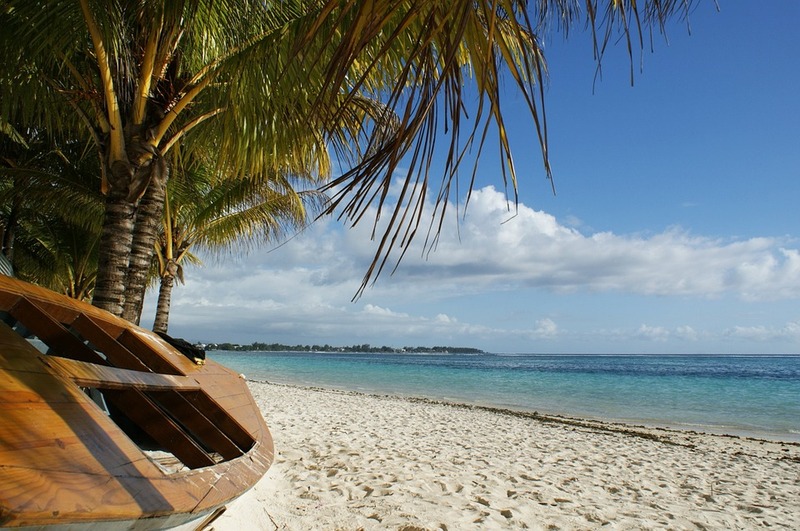 Thinking of travelling to Mauritius? Feel like it’s full of honeymooners and white sandy beaches? Mauritius has always been associated with luxury hotels and Romantic getaways so you wouldn’t be wrong. There’s much more to explore on Mauritius was known as the “Real Mauritius”. I created the Mauritius Travel guide to give you my “Real Mauritius Experience”. Recently getting married in the paradise island and with my husbands family to show me around I gained a great insight into this magical island. I first visited Mauritius in 2017 for a 10 day Trip to look for wedding venues, at first I thought to my self “ visiting such a beautiful island and travelling so far for 10 days just to look at venues has to be crazy I must explore more” after my 10 day trip I managed to make my way around half of the island. 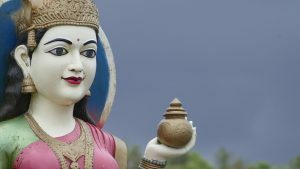 If you are planning a trip to Mauritius the Mauritius Travel Guide will show you the high lights of my trips that can make your holiday your unforgettable. Port Louis is the capital Mauritius, overlooked by many tourists who are in search of a relaxing beach holiday. Port Louis is bursting with heritage and history. Port Louis is a go-to place during your visit to Mauritius. Port Louis is the bustling commercial capital of the island. The narrow streets host street vendors selling everything from spices to fabric. Port Louis can be discovered by cycling or walking, the capital congested for driving. 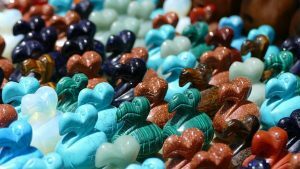 The port Louis market ( also known as the port Louis main bizzar) is a treat waiting to be explored. The market sells exotic fruits and vegetables, clothing, handcrafted wooden products, and local jewellery all for low-cost prices. The market hosts an array of local snacks available from food trucks, a great way to sample the local delicacies. 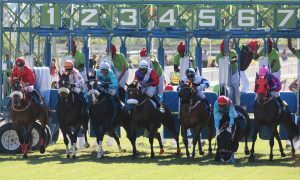 Horse racing takes place over the weekend in Mauritius and is very popular amongst racecourse. The Champ de Mars racecourse was established in 1812 by the Mauritius turf club. The race course is the oldest racecourse in the southern hemisphere and the 2nd oldest in the world. The racing atmosphere is one of a kind which must be experienced. Many tourists and expats tend to attend the races and usually pay for box tickets. The chamarel waterfall is a beautiful picturesque view of Mauritius. 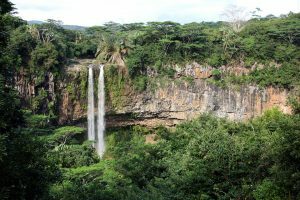 The Chamarel waterfall falls more than 100 metres down and can be viewed against a scenic forest background. The waterfall can be viewed from the top of chamarel, the hike is easy! The park also hosts the 7 coloured grains of sand. Entrance to the park is $6 to view both attractions. 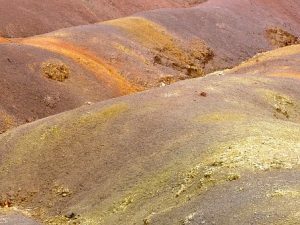 Part of chamarel is the 7 coloured grains of sand, the best time to visit the sands is when there is little or no rain as the full colour is visible. Many years ago an active volcano erupted in Mauritius causing this part of land To be infertile. Casella nature park has to be the highlight of my trip, anyone travelling to Mauritius must add this to there to do list. 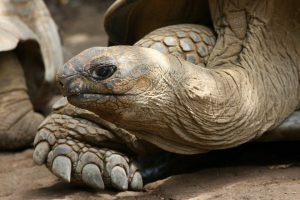 Generally, I dislike zoos as they coup animals up in cages for the entertainment of tourists and locals, but Casella zoo is more than just a typical zoo its more of a nature reserve. The animals have a good quality of life in their actual habitats. Casella is located in the south of the island in flic on flac and can be a great day out for adults and families with young children. General admission is around $25 and allows you to visit 4 themed kingdoms via a bus safari, giraffe viewing, and big cat viewing. The additional extras are where the fun begins giving you the full safari experience you can take a quad safari, feed giraffes or tortoises, speed down the zip wire and even walk with Lions. Raaah! As a Hindu Grand Bassin is an inspiring place. Grand Bassin is an inactive volcano crater surrounded created into a sacred lake. Many years ago a priest from India poured sacred water into the crater creating the lake making it a holy place for most Hindus to visit. Grand Bassin hosts a large Hindu temple where you can learn about the different Hindu gods as many of them are on show in forms of statutes. There is a Hindu saying “if you take some sacred water from the lake it will never go bad and will forever be clean.” Grand Bassin is definitely a place to visit. Has the Mauritius tour guide given you a new insight Into the island? Has it inspired you to travel to the island for your upcoming trip? why not stop over at Dubai visit “Dubai Travel Guide“. More of the adventurous traveller? why not visit “Mauritius Adventure Travel”. Please do share the Mauritius travel guide with your friends and family. Feel free to leave comments about the site we would love to inspire more people to visit the beautiful island.